Backstreets and Lawrence Kirsch are pleased to present a celebration evening of longtime Philadelphia favorite, Rock and Roll Hall of Famer Bruce Springsteen. Fans from Philadelphia and elsewhere are invited to attend the first-ever Philadelphia Springsteen Memories Roadshow. With the ongoing display of the Hall of Fame’s Springsteen exhibit at the National Constitution Center, we invite all Springsteen fans, old and new, to visit the exhibit during the day and then come and party with us on the evening of Saturday, April 21 at McFadden’s Citizens Bank Park. Admission will be free (along with special incentives for all who register online in advance to attend at www.mcfaddensballpark.com/roadshow). Fans who attend also will be asked to make voluntary donations in support of two charitable organizations long supported by Bruce Springsteen: the Kristen Ann Carr Fund for research and treatment of sarcoma cancers and Philabundance, the Delaware Valley’s largest hunger-relief organization. On this special night, please donate whatever you can afford, large or small (cash only, please), to help fill our “wrecking ball” against hunger and illness. We invite you to bring your Bruce Springsteen mementos, photos, t-shirts, posters, books, ticket stubs, albums and especially your Bruce stories and memories to share with other fans who have appreciated Bruce Springsteen’s appearances in the Philadelphia area since 1973. Springsteen cemented his long-standing ties to the city with his Academy Award-winning song “The Streets of Philadelphia”. 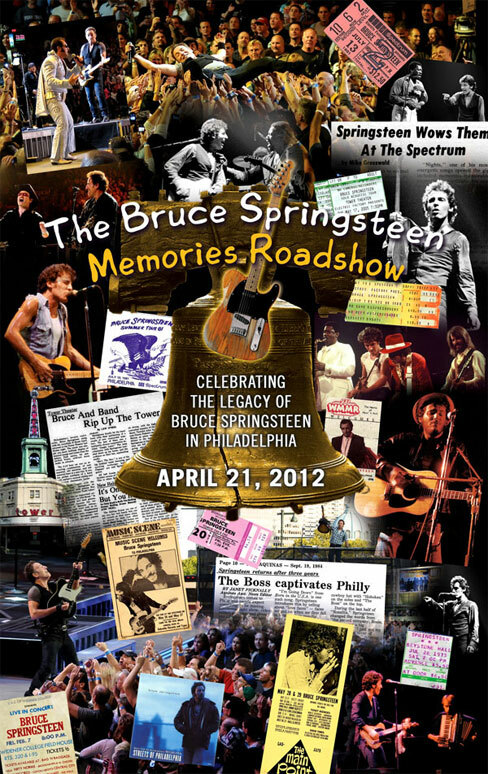 From famous and historic Philly-area shows at The Tower Theater and The Main Point to Bruce’s record setting performances including his final four concerts at the gone-but-not-forgotten Spectrum arena in October 2009, Philadelphia has a special place in the hearts of Springsteen fans. Come meet local photographer Art Reilly. Art has been a Bruce Springsteen fan since 1972 and photographed him in concert at historic venues such as Widener College, Kutztown State College, and The Roxy Theatre in Philadelphia’s Roxborough section. Art also worked with MacAvoy Stage Lighting on Marc Brickman’s crew as Assistant LD for Bruce Springsteen & The E Street Band on the road from 1972 through 1974. He also has photographed The Rolling Stones, Stevie Wonder, Jimi Hendrix, Led Zeppelin and more. Some of Art’s Bruce photos have appeared in the Springsteen book For You: Original Stories and Photographs by Bruce Springsteen’s Legendary Fans. 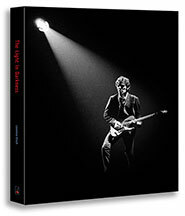 Also meet Lawrence Kirsch, professional music photographer for seventeen years and publisher of the Springsteen book For You: Original Stories and Photographs by Bruce Springsteen’s Legendary Fans. Lawrence also pioneered the “Springsteen Memories Roadshow” concept with a successful Boston event last November and more events planned this year for various locations, including the Philadelphia Roadshow. Lawrence will be signing copies of the limited edition book The Light in Darkness, which serves as an unofficial companion volume to Bruce’s box-set The Promise: The Darkness on the Edge of Town Story. The Light in Darkness will be available for sale during the evening at McFadden’s on April 21. Backstreets, the premier Springsteen fan magazine/website, is a proud sponsor of the Philadelphia Springsteen Memories Roadshow and a Backstreets representative will be on hand for this special event. From Philadelphia photographer Phil Ceccola to early Springsteen supporter and radio personality Ed Sciaky, Philadelphia has an incredibly rich history in documenting the career of Bruce Springsteen. Come join us for an evening of Bruce Springsteen memories and discover fans and friends who have the same passion as you! A limited number of Philadelphia Springsteen Memories Roadshow commemorative posters also will be distributed to attendees on a first-come, first-served basis. Please note: Fans of all ages are welcome. Please be advised, however, that under Pennsylvania law concerning establishments serving alcohol, NO ONE under 21 yrs. of age may attend without accompaniment by a parent or legal guardian and ALL persons under 21 yrs. of age must vacate the premises no later than 9:00 p.m.
Free Admission, Charitable Donations requested/encouraged. Fans who pre-register online to attend at www.mcfaddensballpark.com/roadshow also will receive a $3-per-ticket discount on tickets to the National Constitution Center’s exhibition of From Asbury Park to the Promised Land: The Life and Music of Bruce Springsteen and a 20% dinner/drinks discount at McFadden’s on the night of the Memories Roadshow event. Out-of-town attendees who pre-register online also will be offered discounted hotel-room rates at the Holiday Inn Stadium hotel, within walking distance of McFadden’s and public-transit routes to and from the National Constitution Center.